Digital UltraViolet and Digital Copy will makes it possible for you to stream the movie Life of the Party UV or iTunes Code instantly to your computer and compatible Smartphones, Andriod, iphone, iPod Touch, iPad and tablets devices anytime, anywhere. 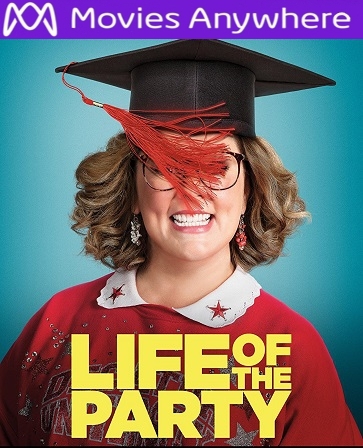 You can also download a Digital UltraViolet Copy or a Digital Copy of the movie Life of the Party UV or iTunes Code to your computer and compatible devices. Melissa McCarthy is freaking’ hilarious in this movie, I love Melissa McCarthy and this movie is funny. I thought the acting, story, and comedy is great in this movie. I would put this movie as one of the best movies she has done in a while. This movie is a lot of fun. it’s a good mother-daughter film. This is a good movie that was released during the week of Mother’s Day. I really enjoyed this movie and I know you will too. I love how Melissa’s character does all those awkward mom stuff that a child would be embarrassed if their mom went to their college, she did that very well. If you have not seen this movie then I recommend you do. This movie is Cinematastic.